I am a rare breed, an actual San Francisco native. I was born in the city and lived there for many years with my family. Our neighborhood happened to be the famous Haight Ashbury District and I lived there in in the 1960’s during the Hippie era. I remember walking through the Pan Handle and literally stepping over Hippies lying in the streets as I walked with my classmates to school. It was quite an experience and a different time. We used to play outside by ourselves with no fear. I could walk home from school by myself and we didn’t think it was any big deal. As a young adult I attended the University of San Francisco, which was walking distance from where I lived as a child. So what does any of this have to do with wedding photography in San Francisco? Keep reading to find out…. The San Francisco community fancies itself as an art society. People here are very in touch with their “right brain”. What does this mean? Right brainers are focused on creative pursuits and art. San Francisco inspires artists to create. It’s hard to define, but I just know that many of the best San Francisco wedding photographers are concerned with providing their clients with more than just traditional images. They want to use San Francisco as a backdrop for amazing creative and historic images. It is easy to do here, because the city offers so much. Having grown up here, I find myself very much in tune with the beauty and history all around us. We love taking our clients to beautiful places like The Palace of Fine Arts and the Legion of Honor. 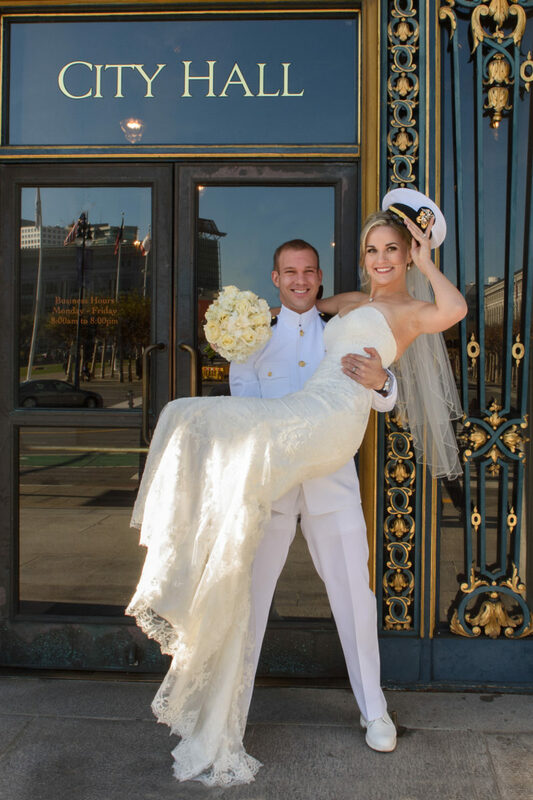 We want to show our couples different aspects of living in San Francisco through wedding photography. When we take couples on a photo tour of the city, we talk about the lifestyle and also show examples. When it comes to San Francisco, it is more than just the beauty, it’s the culture and the history. I know it may be over reaching a little bit, I truly think that many of our brides and grooms like to feel the whole San Francisco persona. The city has so many amazing landmarks and historical locations to take our couples. The Grand Staircase in the photo above is one of these San Francisco Landmarks. Tourists flock to see it and take pictures of it. It makes for a great wedding photography background as you can see. On any given day, you will find many San Francisco residents enjoying the beauty and elegance of these places not only in city hall but outside. This is part of the San Francisco lifestyle, a very easy going pace when compared to other large cities. Hanging out in Golden Gate park, spending time by the Painted Ladies or just walking on Baker Beach. These activities are all part of how people live in the City by the Bay. The fact that I grew up here makes me even more motivated to show visitors what a fun place it is to live. It certainly is a great place to be a wedding photographer. 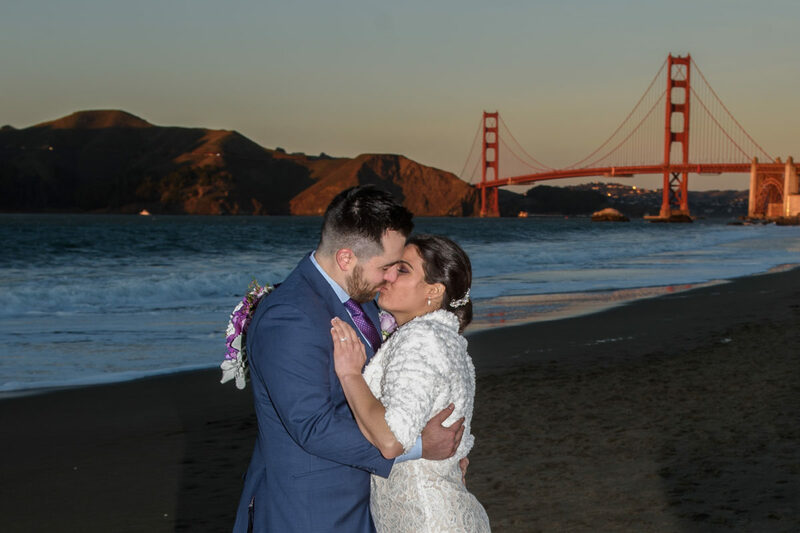 We look forward to sharing our vision of San Francisco with all of our clients, brides and grooms or engaged couples whether they live here or are visiting from other countries. Quinceneara Photo Shoots – These brightly colored 15 year old girls come into city hall with their photographers and take over certain parts of the venue. Their photographers often take way too long on the Grand Staircase and bring large lighting equipment. We avoid them as much as we can. Protest Marches – San Francisco city hall is a popular place for protests and at times they come in the building. Even if they don’t they can often easily be found right outside at the entrance. School Tours – City Hall is “invaded” quite frequently by mobs of school kids touring the facility and learning about government. Depending upon their ages they can be an unruly bunch! Dramatic Portrait Shoots – Professional photographers will often take their subjects to city hall to get photos. The subject matter can range from ballerina dancers to people dressed as animals. Service Dogs – City Hall allows Service dogs to enter the building with their companions. Sometimes causing some pretty crazy moments as the dogs react to their surroundings. Political Speeches – Yes, San Francisco city hall attracts and arranges for candidates and politicians to come in the building and make their case. There are many more examples, but you get the point. Rather than trying to always avoid these things, we can sometimes use them as a backdrop to our wedding photography shoot. Putting the couple in a natural setting and showing what was going on that day can add yet another memory to their special day. The humor in the situation will also help the couple not feel so unhappy about the disruption. We will still get their great romantic pictures, but we will also add a little fun! 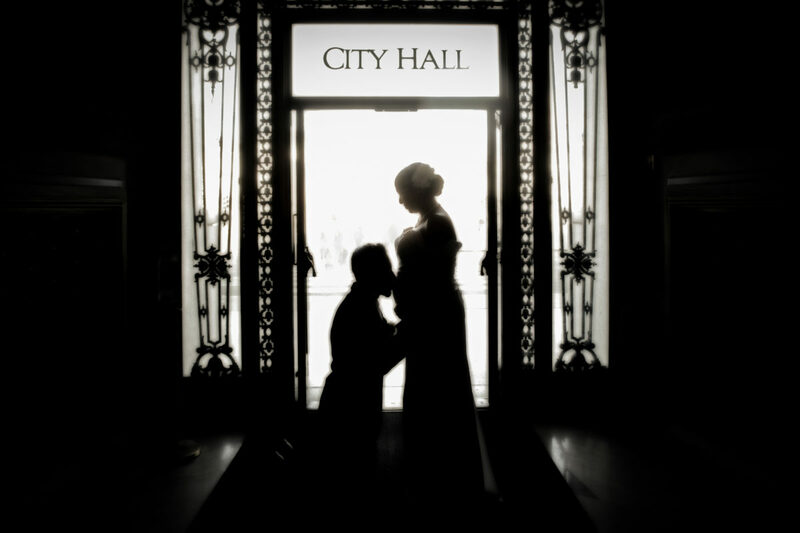 One of the first things our clients ask us when we begin our City Hall wedding photography shoot is the sign picture. They all ask: “Can we do the City Hall sign photo?” I always let them know that of course we will, but it is best to save it for last because we avoid having to through building security twice. I remember one particular groom seemed agitated during the whole city hall photography tour and I finally asked him if he was OK. He told me he couldn’t understand why we were not taking a photo with the sign, but didn’t want to seem pushy. Once I explained to him why we save it for last he felt a lot better. There are many variations to this ending shot. You can do a simple posed shot and walking shot or celebration photo. No matter what we end up doing with each couple, I think it is important for this photo to say something about the bride and groom. Some couples want to be animated and be celebratory. Others prefer a more traditional posed image. Some of our couples prefer to do more natural photos in front of the sign. We will ask them to walk out of the building and raise their arms in a celebratory fashion. “Yay, we did it! 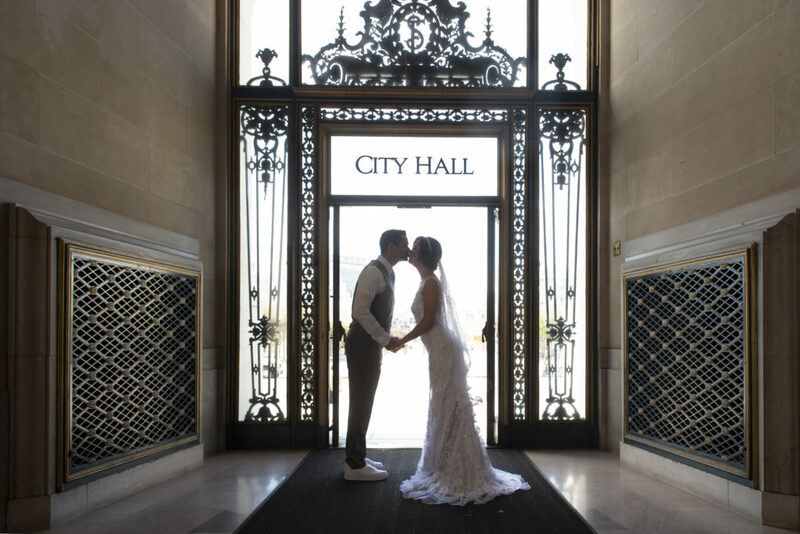 We got married at San Francisco city hall!” These types of shots always give you the most bang for your buck in terms of showing emotion and fun. September is underway in San Francisco and it is one of the most beautiful times of the year. San Francisco residents tend to call the time period between early September and mid October “Indian Summer”. I will skip the technical explanation of why the fog is so thick during the summer and starts to gradually go away in September, but for those interested check out this link about San Francisco Weather . The most important thing to know is that September is a great month to explore the city and head to the beaches. 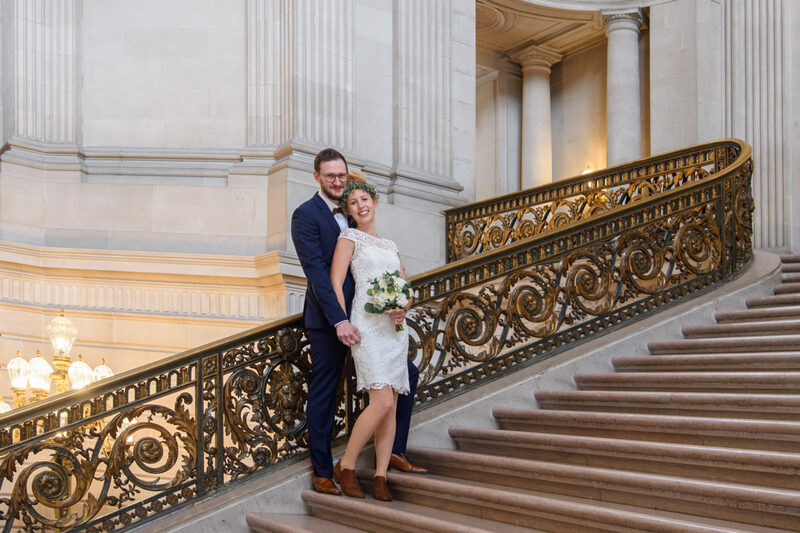 If you happen to be getting married at San Francisco City Hall or anywhere else in the city for that matter, you owe it yourself to have your wedding photographer take some outside pictures. For those couples who were worried about trying to visit the Golden Gate Bridge during the summer, feat not! By mid month, there will be very little fog along the coast and the bridge will be as bright and beautiful as ever! Fall winds will make the air super clear also, leading to some amazing photo opportunities. Baker Beach – We tend to avoid Baker Beach during the summer because of the fog. It is the most risky place to take our brides and groom that time of the year because the view is from the Ocean looking in. Since the fog tends to roll in from the water, the bridge is often covered from that angle, but still visible from the Bay side. But in September with the fog mostly gone, The Golden Gate bridge can look spectacular from Baker Beach. Lands End – This is one of my new favorite places to look at the bridge. It includes a nice short hiking trail and some amazing scenery. For more information regarding this spectacular view point, click the Lands End Link provided. To summarize, September is an amazing month to be in San Francisco! Take advantage of this great time and explore this beautiful city. Everyone wants photos of the Grand Staircase at San Francisco City Hall. It is the central theme in this amazing building and so consequently every bride and groom wants their photo taken there. 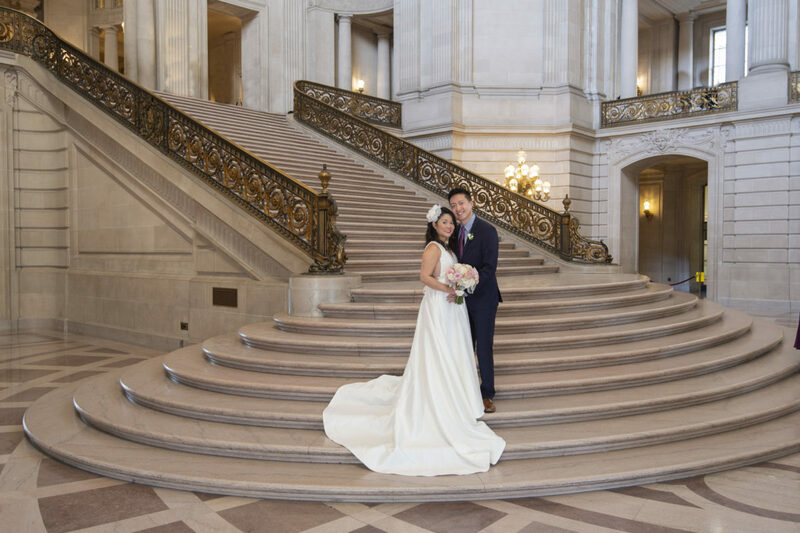 Obviously this presents a massive problem….. Not only do all 35 couples who get marred at city hall on a daily basis want there photo on the Grand Staircase, but the tourists love to hang out on the stairs and take their own photos. It can be a huge challenge especially on Fridays to get a nice image with the Staircase not completely covered by other people. 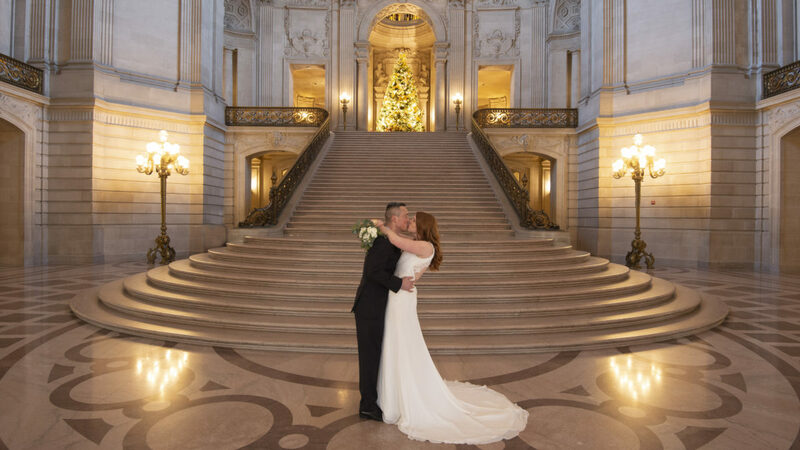 So how do we as San Francisco city hall wedding photographers, handle this problem? The image above was taken at a time which also illustrates the importance of timing at city hall. We set this image up at around 5:30 pm and it was our final shot of the day. The other technique for getting the Grand Staircase shot is doing it very late in the day after people leave. So this teaches us that if the staircase shot is very important to you, book your wedding late in the day. The last ceremony time is 3:30. Book that one and by the time you get married and we complete our city hall photo tour it will probably be around 5:00 pm. A very good time to take photos of the staircase with less people around! 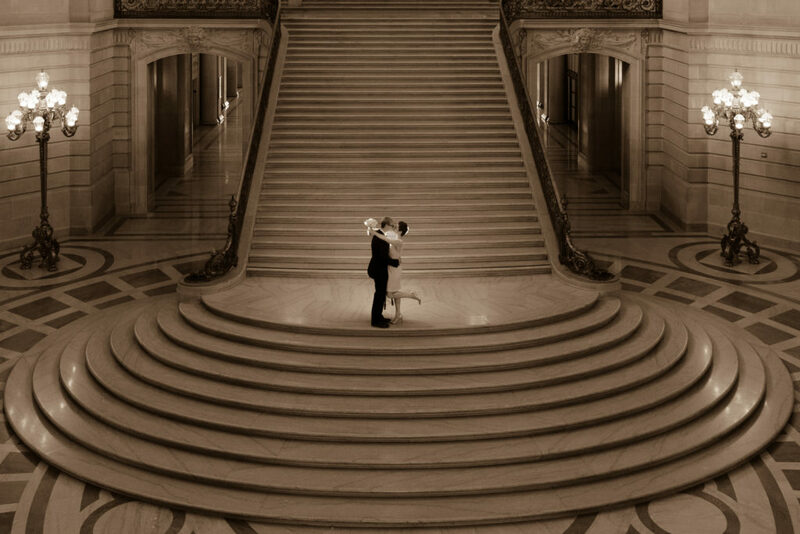 We always talk about how great San Francisco City Hall is for weddings and of course Wedding Photography. There are so many iconic locations to shoot here, most notably the Grand Staircase, Rotunda and Mayor’s Balcony. Wonderful backgrounds for wedding photography with amazing early 1900’s architecture. 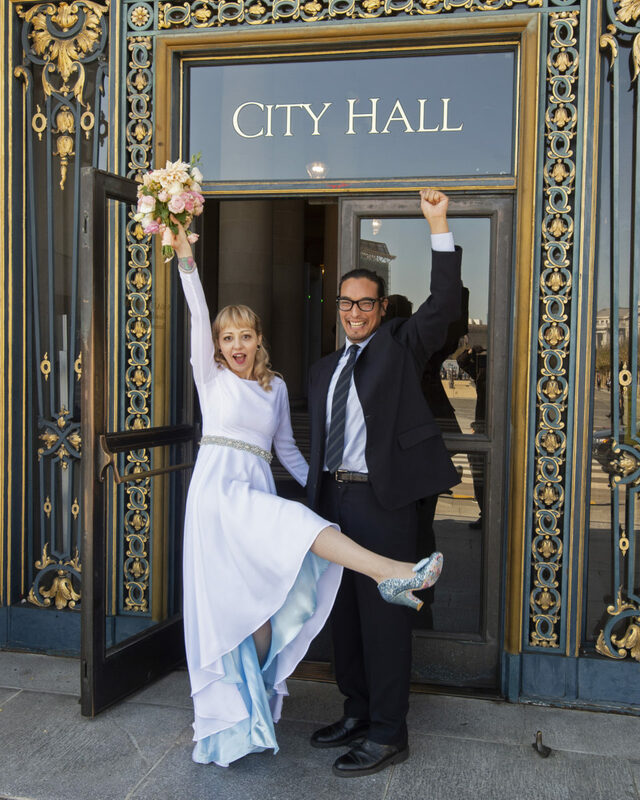 However, were you aware that there are times that you will arrive at city hall to get married and some or all of these places are not available and roped off? 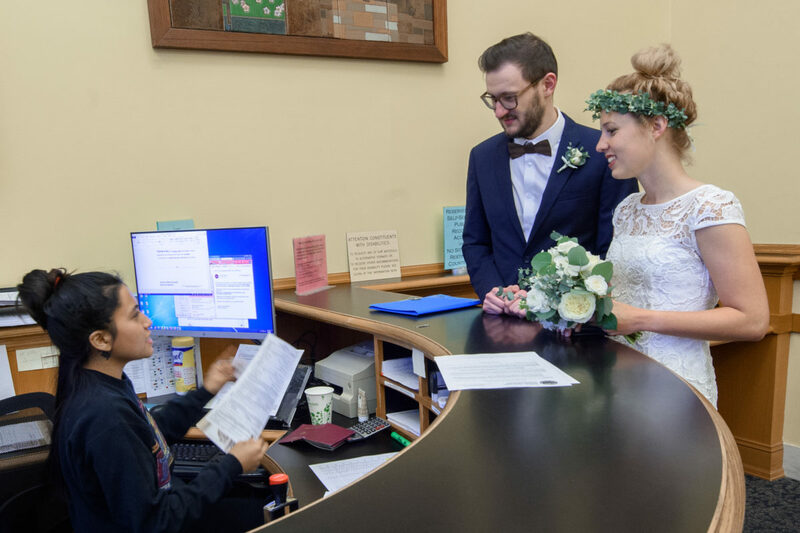 This is the big secret that The County Clerks office never tells you when you sign up to have your ceremony at city hall. 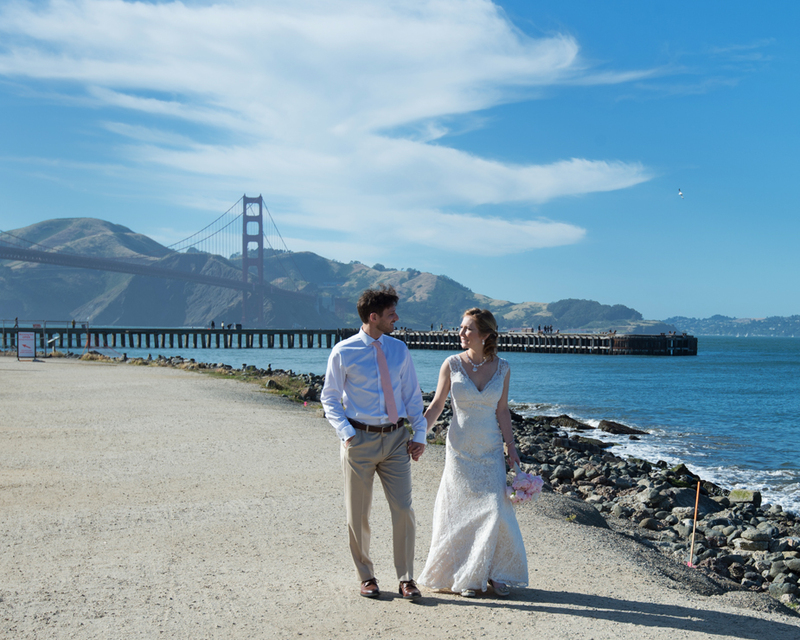 Brides and grooms are frequently surprised when they learn that the most beautiful background in San Francisco is unavailable on their wedding day. Why? Because an event has been scheduled at the same time as your wedding! San Francisco just happens to be one of the favorite places on the West Coast for companies to schedule their special events. In addition, local entities such as the Opera House, The Symphony and even Google love to have their events in San Francisco. Guess what is one of the most popular event locations for elegant events? Yes, San Francisco city hall! There have been times that we as wedding photographers have walked into the building ready to shoot a wedding only to see hundreds of people milling about wearing fancy clothes. Half of the building can be closed off and they provide you a narrow path through the mess to get to the Clerk’s office to have your ceremony. 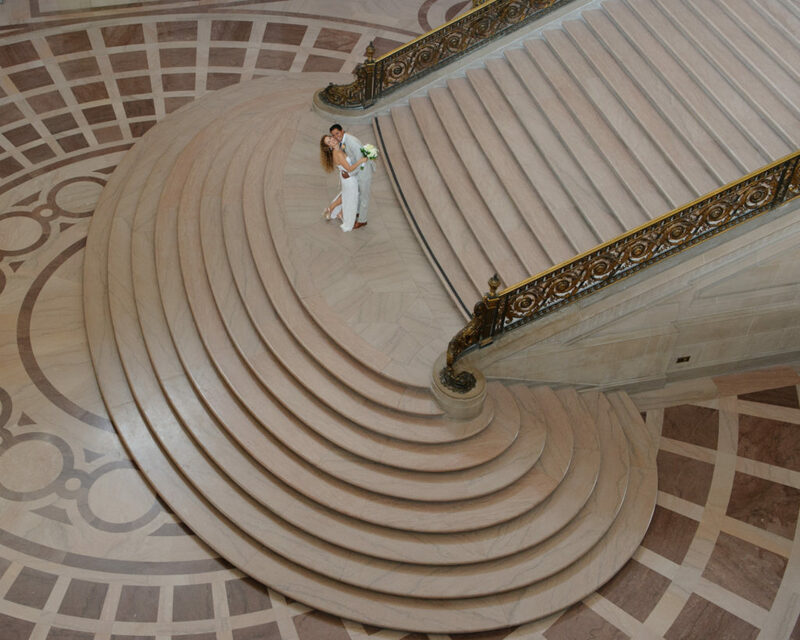 The fact is, SF City Hall does not guarantee you access to the whole building when you reserve your ceremony time. The only thing they promise you is that you will have a legal marriage. Nothing else is promised, but of course full access is implied. So what does a bride and groom do to avoid this happening to them? Through the years I have attempted to find a good web page that is kept up to date and lists city hall events in San Francisco. I have never found one that is actually updated. Most are just blank pages and some show past events. Thus, the only thing an engaged couple can do is try avoid scheduling their wedding on the prime event days and times. Fridays should be avoided, but if you have to, make sure it is early morning only. The Staircase can often be closed all day or they start setting up late in the afternoon. The building hosts music and some form of entertainment almost every Friday at Noon. Thursdays, especially after 3 pm. This day of the week is also quite popular for events. Sometimes if San Francisco city hall is going to have an all day event on Friday, they will start the set up late on Thursday. In general, any day of the week after 3 pm . Even though it is rare, there are events early in the week. If city hall schedules them, it will most likely be in the evening or late afternoon. The tough part of all of this is that the late afternoon times are some of the best for wedding photography and no crowds. So we often recommend that people book the last ceremony of the day because city hall starts to become less crowded late in the afternoon. For me, the best times and days of the week overall are Tuesday and Wednesday afternoons. There is a small risk of an event, but overall the experience is usually good on these days late. 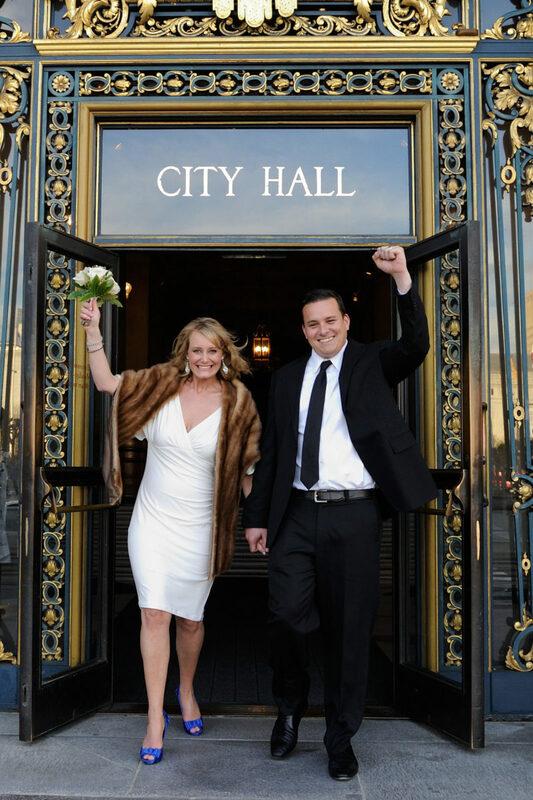 Many of our San Francisco City Hall wedding couples like us to photograph a formal engagement session prior to their marriage. We can make a package for any couple that includes a San Francisco engagement session at any of the popular city locations. Our most popular location continues to be The Palace of Fine Arts, but there are many others. 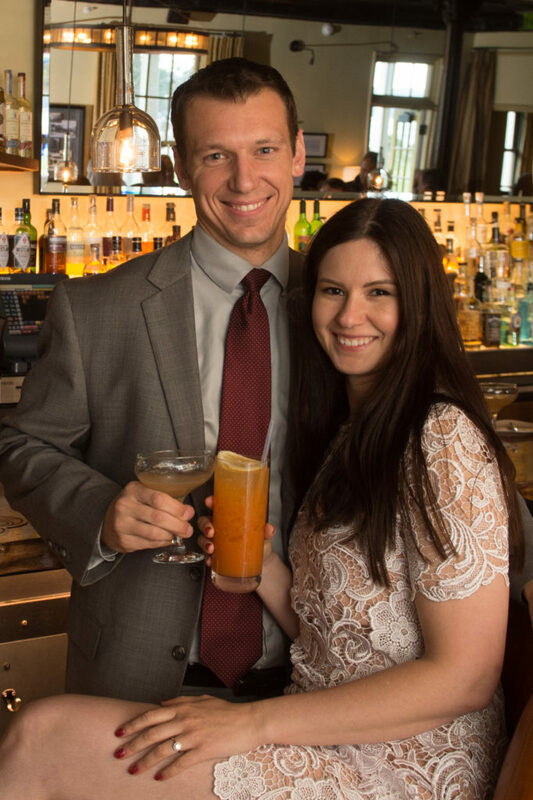 We take our couples to Russian Hill, North Beach and the Legion of Honor to name just few. 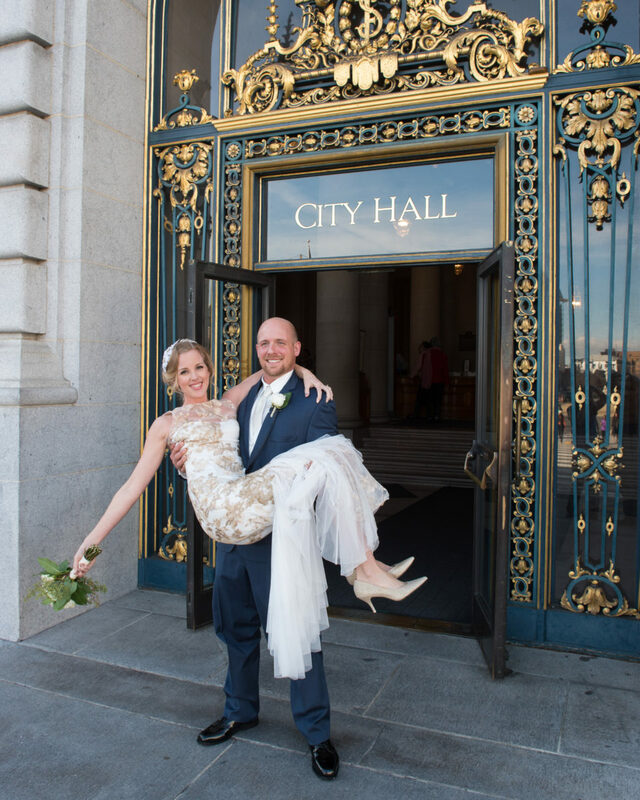 Believe it or not, we even sometimes do our sessions at San Francisco City Hall! 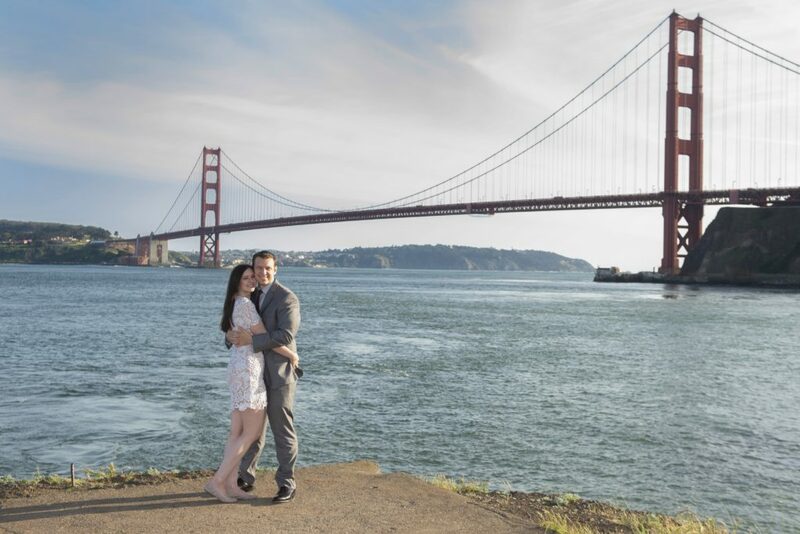 Our most recent engagement shoot occurred in Marin County at Cavallo Point close to Sausalito. This was a fantastic location for the session especially with it’s unique angles to the Golden Gate bridge and the view of San Francisco. In the image below, we placed our future bride and groom on the Break Water with the bridge in the background. It was about 1 hour before sunset when we set this up. From this angle we found a great looking cliff that was right up against the San Francisco Bay. We placed our couple up on the cliff and took a series of images of them with a few different suggested poses. The War Memorial Opera House Garage. 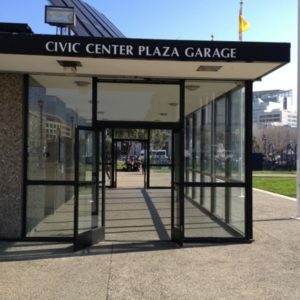 Another nearby option is at the Opera House behind San Francisco city hall off of Van Ness. It may appear to be a little farther away, but in reality it’s about the same distance assuming you use the back entrance to city hall. 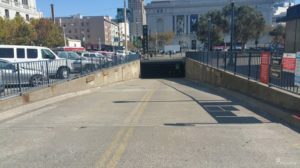 Just cross Van Ness street and you are there. It also offers covered parking and decent pricing. It’s usually available unless there is a big event going on there (like the opera!). But since most city hall weddings are during the day, you should be able to park here with no problem. Click here for details on Opera House parking. The above options are the most common ways that brides and grooms find parking for their wedding. But there are many other possibilities. This article shows some other great places to park so check it out and happy parking!